Of all the career paths the Sims franchise ever offered, the criminal career track was the most morally unambiguous with the least amount of consequences… until now. Now, you can go to jail while working the criminal career path. Now, you can steal things from your friends' and neighbors' houses. 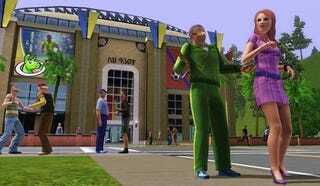 Now is when The Sims 3 gets interesting; because for the first time since a sim slapped on a striped t-shirt and snuck off into the night, players might find themselves facing real moral dilemmas instead of just random chance events. The Sims 3 is the latest sequel in the crazy-popular EA Sims franchise that started in 2000. The entire game is a life simulation that covers a "sim" life from birth to death – and maybe a little bit beyond. Players act as an omnipotent being that can micromanage every aspect of a sim life, or just leave them to rot and die in a puddle of their own urine. The structure of the game is an open world with no narrative and no ending. So – like a dollhouse, only your dolls can die. Associate Producer Grant Rodiek co-piloted me through the creation of two Sims and a tour of their neighborhood, which included their houses, the local gym, the cemetery and the headquarters for the criminal career path. The Sims 3 was pushed back from a February 2009 release to June 2, 2009. The game is essentially final, but EA really wants that one last layer of polish before releasing it into the wild. Glitches, Bugs, Hiccups: The Sims is a huge game; lots of little things like a twitchy animation or a grammar error get missed. I saw only one major bug where something pops up when it's not supposed to; but one hour isn't nearly enough time to comb through the entire game for every instance of minor screw-ups like that. Online integration: The online community for the Sims franchise has always been active in creating custom content (my personal favorite being vials of poison for those pesky sims you need to kill off quickly); but ties between the game itself and the community have been weak. Supposedly Sims 3 will allow you to share even more custom content with the online community – but unless there's some incentive to do so (like a create-a-look-alike sim competition), the community won't change very much from its Sims 2 level of participation. You still can't get your kids back if the Social Worker takes them: So much for total realism. The unspoken narrative: New things like Traits, Career Paths, Opportunities, Wishes and Lifetime Wishes all serve to create more of a narrative for the lives of sims than in previous games. Traits determine a sim's personality, personalities determine what Career Paths the sim will want, the Careers open up Opportunities (which are like mini-quests) and play into a sim's Lifetime Wish, which also guides immediate Wishes. It's all connected somehow, so you never feel like you're not doing something or working toward some goal, which makes those chance events even more meaningful. "Decaying to neutral": Sims 3 won't punish you for not fulfilling Wishes or answering the phone every time a friend calls. Relationships decay to neutral rather than deteriorating to the point where you have to work really hard to get them up to friendship status again. And if you sit back and do nothing for your sim, it won't flounder and die in a puddle of urine – it will largely look after itself; although it won't be all that happy if none of its Wishes are fulfilled. The sense of humor: Everything from the gameplay to the text has something amusing about it. Example, Rodiek showed me a negative personal interaction that carried the option to "Imply Mother is a Llama." While doing so, he related to me the story of one of his sims that had an unlucky trait which 1) caused the sim to die whenever the he tried to repair something and 2) Death to feel sorry for him and resurrect the sim repeatedly. That sounds more hilarious than my pregnant sim that caught fire twice in The Sims 2. The tweaks we've long been waiting for: You can now place items on half-tiles so they straddle a line on the grid in buy or build mode; pick up and throw away things for your sim without telling them to do it; and turn all items diagonally. If you were ever a Sims fan, two of these tweaks alone will make the game worth your while – never mind all the new stuff. You can now pick shoes to go with outfits: Awesome. Playable ghosts: Twice as awesome. I'm on the fence about the UI overhaul. On the one hand, it will be easier for newcomers to find what items they want or which hair color they like because everything is arranged intuitively and options are embedded within submenus so as not to overwhelm the noobs. But on the other, it might be hard for old hats like me to find something we're used to seeing all the time and we lose a little nostalgia at not being able to see stats like Bladder, Environment and Social right from the start. It's obvious by the big 3 in the title that this game will appeal to the fans of the first two. It doesn't matter what's different and only barely matters what's the same; there will be hordes of people buying it whenever it comes out. But I think EA did right by making Sims 3 with as much new stuff as they did and by taking the time to polish it as much as they are. Whatever else Sims 3 is – "game of the year," "for fans of the genre," "Will Wright's plan to take over the world," etc. – it's most definitely not Sims 2.5.